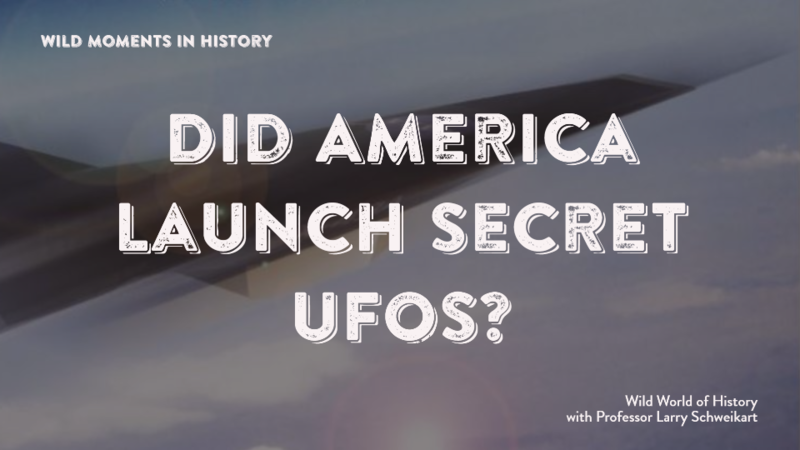 Did America Launch Secret UFOs? Did you know that the U.S. Air Force had a radical airplane program in which a jet would fly into outer space? You read that right. A jet. In airless outer space. The plan originated in the late 1970s when the Space Shuttles—which were originally heralded as “routine” access to space. Ever watch a Space Shuttle launch? It takes weeks. For the last few days alone, it’s a scene out of the Egyptian slave movies where this monstrous gantry crawls across a few hundred yards to the launch site, as if pulled by armies of Egyptian slaves. Finally the launch countdown starts, only to be stopped a dozen times because of birds, cold weather, drones, or some other interruption.. The Shuttle finally lifts off amidst crowds cheering and NASA engineers shaking each other’s hands. When you get in your car and start it up, that’s routine. Do you ever cheer when your car starts? (Well, perhaps one or two . . . .) Do you shake your neighbor’s hand, and cry? The point is, the Shuttles were anything but routine. DARPA (the Defense Advanced Research Projects Agency) came up with a plan in the late 1970s for a sleek jet that would use “scramjets” (supersonic combustion ramjets) to power it to Mach 25 (that is, about 25 times the speed of sound.) I know, you’re saying, “Wait, so how fast is that?” and like may things the answer is “it depends” on temperature and other variables, but all that aside, it was thought the airplane would have to reach speeds of about 15,000-17,000 miles per hour to attain a low earth orbit. At that point, the airplane could literally use its momentum to reach airless space. Once in space, small maneuvering rockets would allow it to perform tasks, then propel it into the atmosphere where the scramjets would again take over. Obviously there were major hurdles, but the return seemed more than worth the investment. For example, the “spaceplane” would take off and land like a normal jet, thereby chopping months off the turnaround time. Some even argued it could be quickly checked and refueled for another trip in a matter of weeks! When the program finally got serious funding under the Reagan administration, it was a “joint” program of the Navy, Air Force, Strategic Defense Initiative, DARPA, and NASA. Eventually only the Air Force and NASA remained in the project. Its challenges were immense, most notably getting materials that could withstand 15,000 miles an hour in the atmosphere without being so heavy as to ground the aircraft, and then, of course, making the scramjet work. From 1983 until 1995 the program and five major aircraft/engine makers worked on these problems, making immense headway, but still being too far away to continue. The National Aerospace Plane (NASP) program was terminated in 1995. But it had proven key concepts in radical (slush Hydrogen) fuel production, storage, and combustion; in Computational Fluid Dynamics (because there was no wind tunnel capable of even testing such an airplane, were it to be built); and in advanced materials (some of them astoundingly light, yet vastly tougher than any previous materials. The orbital jet would have to wait. For further reading, see Larry Schweikart The Hypersonic Revolution: The Quest for the Obital Jet.